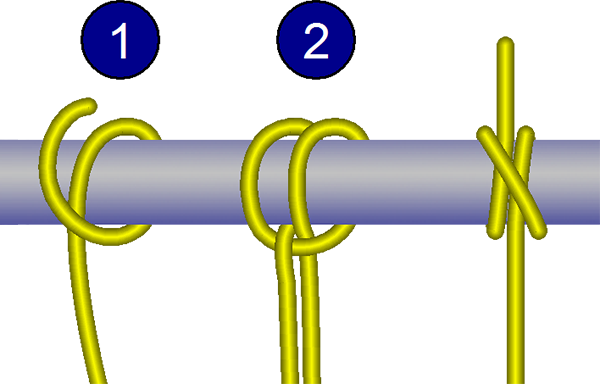 A clove hitch is a fast way to connect the middle of a rope to another object. 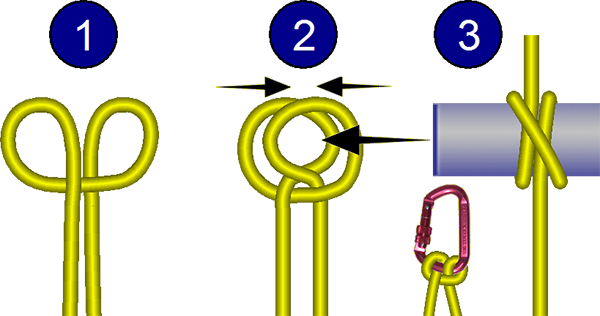 It is easiest to tie a clove hitch around an object where you have access to the end of the object (e.g., a carabiner, fire hydrant, etc) and more complicated to tie around an object where you don't have access to a post-like end (e.g., a telephone pole). The real advantage of a clove hitch is that you can quickly tie it in the middle of a rope. A disadvantage of clove hitches is that they can slip when object the hitch is tied around is smooth and has a "significantly" larger diameter than the rope—they do not slip when tied around carabiners. Clove hitches can be difficult to untie after being heavily loaded. Create two loops that cross on opposite sides. Slide the two loops together to create one opening. Slide the object through the opening or clip the two loops with a carabiner. Wrap the object with a full turn, having the rope end up on the "other" side of the turn. Wrap the object with a second full turn and thread the rope through the second "wrap."